The title of this book alone provokes a reaction. The word slap is so harsh, so violent, and sounds so much worse than ‘smack’. So to discover that the recipient of said slap is a three-year old child instantly brings feelings of discomfort, whether you are in favour of physical discipline of children or not. 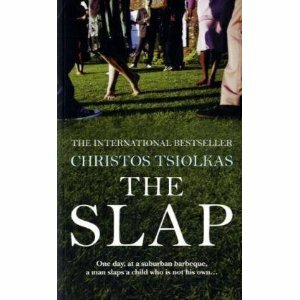 Written by Christos Tsiolkas, The Slap, depicts the complex relationships between a group of family and friends attending a suburban barbeque one summer. One of the guests, Harry slaps an unruly three-year old boy, Hugo, who is unrelated to him. Hugo’s parents, Rosie and Gary are outraged and later press charges of common assault, which leads to a court case. The rest of the guests, who witnessed the slap, begin to agonise and argue amongst themselves over whether striking a child can ever be justified. As a result, tensions rise, buried grudges and petty jealousies surface, and the dynamics between friends and family shift. Hector and Aisha, the hosts of the barbeque, are Greek and Anglo-Indian respectively and are married with two children. Both have differing views on marriage, family and the raising of their children but manage to neatly compromise their opinions, though it threatens to destroy their relationship. Harry, is Hector’s cousin which creates an additional rift in Hector and Aisha’s seeminly perfect marriage, as both disagree on the rights and wrongs of Harry’s actions. Rosie and Gary, the parents of Hugo, are in my humble opinion, very immature and irresponsible as parents, and perhaps in need of slap themselves. Rosie is best friends with Aisha and slips very comfortably into the role of victim on behalf of her son, conveniently ignoring the fact that her failure to discipline her son, has caused much of the problem in the first place. Gary, an alcoholic, casts himself into the archetypal working-class hero role to disguise his feeling of powerlessness and a husband and father. Harry, a self-made man, who is very proud of his acheivement, his family and his lifestyle. At first it seems that his slapping Hugo is an impulsive reaction towards a very unruly child, who appears to be threatening his son, Rocco, but a deeper look into his background reveals some very dark secrets about him. Anouk, is best friends with Aisha and Rosie, though her relationship with Rosie is strained for several reasons. She is single, childless and a successful scriptwriter. She takes a very pragmatic view to what happened and initially blames Rosie for her lack of disciplinary skills but later offers her support as a friend, regardless of her own personal feeling. Manolis, Hector’s father, whose close relationship with Aisha is threatened when he sides with his nephew, Harry. Manolis represents the older, immigrant generation, whose values differ vastly from that of their children. Connie, a teenage girl working for Aisha as an assistant at her vetinary practice. Connie is involved in a brief affair with Hector, and often babysits Hugo for Rosie and Gary, along with Richie, her gay best friend who has a crush on Hector. On the whole, this was a good read, I was struck but how Tsiolkas had arranged the narrative through the eyes of the witnesses, telling more than the story of what happened that day but also, a narrative of family life in Australia. Each character’s perception of family, as a result of their own upbringing and/or experience of marriage, relationships and friendships in part defines their response to what happened. But more tellingly, is the fact that, underlying jealousies, prejudice and class rivalry even between friends and family, play a major part in the ensuing responses, especially in the case of Rosie and Gary, who for the most part are the ‘class underdogs’ of the story. I enjoyed the narrative device employed by Tsiolkas because of the diversity of the characters he chose. The viewpoints ranging from a seventy-one year old grandfather to two teenagers, was inspired and gave differing insights into Australian culture. However, admittedly by the time I reached Richie, I was ready for this tale to be over and I could also foresee that Richie’s chapter served no real purpose other than to bring the tale to an explosive but predictable denoument. I also like the fact that hardly anybody comes out of this story completely innocent as it were. Each person has their own secret, their own hidden hypocrisy which colours their opinion of what happened, and in turn colours your opinion as to who is in the right and who is in the wrong. For me, Harry is wrong for slapping Hugo, not just because Hugo is not his child but because he did out uncontrolled anger. However, Rosie and Gary are responsible for their child’s lack of discipline and are effectively raising ‘a little monster’. Later, you see Hugo spitting on an elderly man, whilst in Richie’s care, for no apparent reason other than he felt like it. Even when challenged by Richie over his behaviour, it’s clear that Hugo has no concept of right or wrong simply because he has never been taught. Whilst understanding that Rosie’s, in particular, laid-back approach to discipline stems from her own overly strict and difficult upbringing, and Harry’s anger issues, are as a result of his violent upbringing it’s clear neither approach is effective. Equally, it is clear that both parties are victims of their own upbringing and the choices they have made to accept, disregard or remain in complete denial of how they were brought up has affected their current circumstances. The Slap is about the way each generation believes it is, and knows better than the last. The notion that you will not make the mistakes your parents made is a theme that runs delicately through the narrative. Better educational and employment opportunities, living in the right area, having the perfect relationship all inform the pre-occupation with ‘having made it’. But there is something missing, as none of the characters, though seemingly having it all are satisfied or even happy, as seen in Hector and Aisha’s relationship. What is missing Tsiolkas, never actually defines, perhaps because he himself does not know. But he inevitably, leaves a strand of hope through the eyes of the next generation, Richie and Connie, whose youthful open-mindness might perhaps avoid the pitfalls of their elders. Posted on 22 June 2011 15 March 2018 by queenpea77Posted in ReviewsTagged fiction, just-read, reviews. Previous Previous post: Hello book lovers!